ntopng implements different techniques to automatically identify the device type of the devices connected to a network. This includes printers, IoT and phone devices. 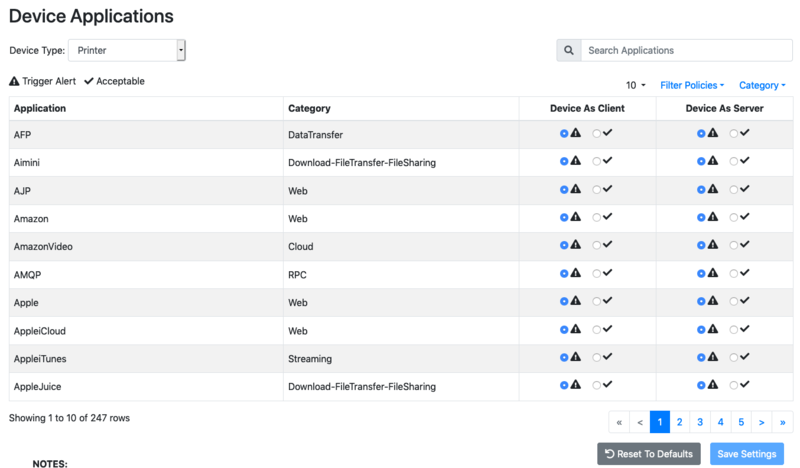 For each device type, ntopng provides a configurable set of policies to determine which protocols are acceptable for the specific device type. When a non-acceptable protocol is detected, ntopng generates an alert. ntopng provides some built-in policies which should suit most environments. The Device Protocols Alerts must be enabled in order to be able to configure the policies. Policies can be reviewed and customized in the Device Protocols page. Each policy is splitted in client and server configuration. For example, in the picture above a Printer can act as an HTTP server but not as an HTTP client. When alerting is not enough, nEdge can be used to block the new devices protocols according to the configured Device Protocols policies.